The Commission has approved the Fiscal Year 2019 Renewable Energy Fund program budget. The Commission has also approved reopening the REF programs. On March 8, 2018, the Commission issued Order No. 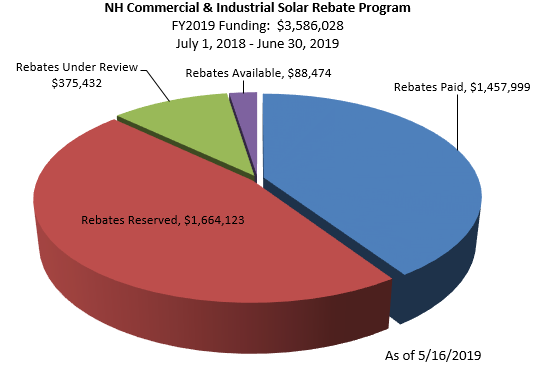 26,111 to modify the Commercial and Industrial Solar Incentive Program (Program). This Program has been modified by Commission Order to consolidate the two eligible project categories: Category 1 was previously for solar electric and thermal systems rated less than or equal to 100 kW (AC) or thermal equivalent and Category 2 was previously for solar electric systems greater than 100 kW (AC) but less than or equal to 500 kW (AC). Incentives are limited to 25% of the total project cost or $50,000 if less than the AC incentive payment otherwise calculated, whichever is less. The Program is available to non-residential structures with a commercial electric meter located in New Hampshire. •Expansions to existing solar systems are not eligible. For complete program details, please refer to Order No. 26,111 and Docket No. 10-212 or contact CISolarRebate@puc.nh.gov or (603) 271-2431. Funding charts are an approximation of available funding and provided as a courtesy. Charts do not represent a guarantee of funding availability which is subject to change. Order No. 25,878 (April 6, 2016) Modifying Commercial and Industrial Renewable Energy Incentive Program. Order No. 25,764 (February 20, 2015) Expanding and Modifying Commercial and Industrial Renewable Energy Incentive Program. Order No. 25,151 (October 1, 2010) Establishing Initial Commercial and Industrial Renewable Energy Incentive Program.